A new student walks into Itay's training facility. He hasn't even changed into workout gear and he is already complaining. "The place is stuffy, why don't you have more fans, the country club where I took some Taekwondo had air conditioning". Itay looks at the guy and says, "Here, suffering is part of the program". "You learn to fight and defend yourself under stress, not in country club conditions." Indeed the place is rugged looking, no frills at all. 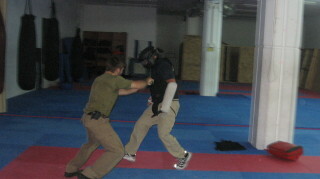 You work hard, you sweat, you train under difficult conditions and you become a Krav Maga fighter. When I was training security guards there one of them likewise had some complaints about the conditions. I told him to take it up with Itay. He did. Itay said to him, "and when you were in the army did you complain about the conditions there as well? next thing you will be asking for a Jacuzzi!". Training under less than optimal conditions pushes you a bit more, you have to reach inside and find a little more motivation; you have to want it more. In time you learn to mentally block out the conditions, the lack of fresh air, the discomfort, the sweat, you overcome it. You learn to fight under any conditions. This is testimony to Krav Maga's combat roots. It is not a sport, it will not be featured in the Olympics, it was born in combat and remains true to the principles of combat.